Last 72 hours for submissions: publication date must be between July 1, 2017, and September 17, 2018. 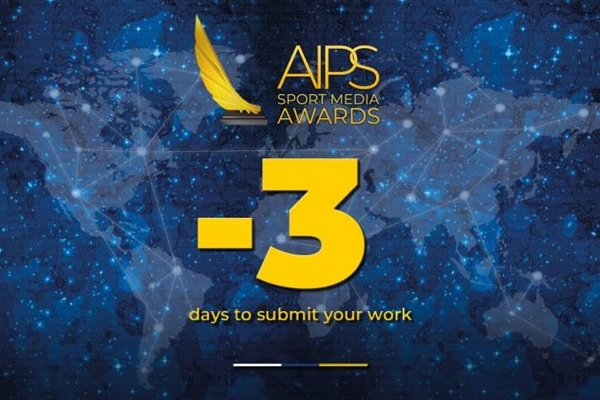 We have now entered the last 72 hours for the AIPS Sport Media Awards submission deadline. Journalists from all over the world have been sending us their work in these last days. And there is still time until Saturday, September 22nd, at 18:00 (Central European Time). -Period of publication: July 1, 2017 to September 17, 2018. -Eight subcategories, as follows: Photography (Action), Photography (Portfolio), Writing (Best Colour Piece), Writing (Best Column), Video (Athlete profile), Video (Documentary), Audio, Journalistic Weblog. -Up to two submissions per person. -Submissions must be entered separately. -No need to be an AIPS member to compete. -Prizes are US$ 8,000 (winners), US$ 3,000 (second placed), US$ 2,000 (third placed). -Final gala will take in Lausanne, Switzerland, in January 2019. All finalists will be invited. Haven't you submitted yet? Do it now. Simply go to www.aipsawards.com, register and upload your articles, photos, podcasts, videos or blog entries.